SDCC 2018 was a great X-MEN:TAS experience! First, Julia and I were accompanied by six “Team X-Men” volunteers (some family members), all decked out in “Previously on X-Men” shirts and hats. Amazing fun had by all. We had two panels. The one celebrating producer/director LARRY HOUSTON’s career was topped off with the SDCC’s highest award for lifetime achievement, the INKWELL. At the other panel, which celebrated 25 years of X-MEN: TAS, we received a standing ovation (our first) from the standing-room-only crowd. At a massive panel hosted by our friends at SCREEN JUNKIES, there was a “Battle,” a five-minute debate whose theme was: “What is the greatest animated series ever — X-MEN or Batman?” It was close, but the thousand-plus crowd voted for X-MEN! And finally, we and X-MEN:TAS writer Len Uhley were able to grab some table space beside guest-of-the-Con Larry Houston and sell some copies of “Previously on X-Men.” Five days of fans, fun, and exhaustion that were truly memorable for us. We are pleased to announce that we will be at the San Diego Comic Con next week. We will be at two panels. First is SPOTLIGHT ON LARRY HOUSTON on Thursday morning at 11:00am in room 5AB. 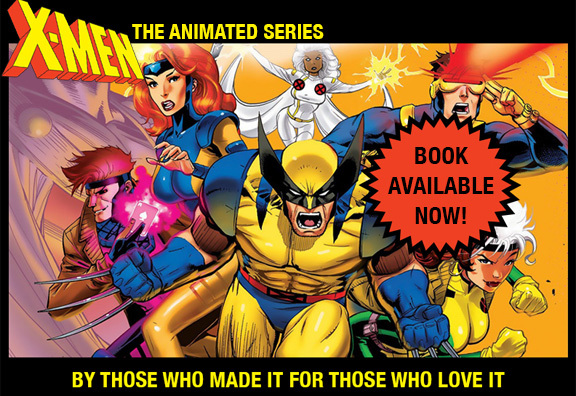 I will be moderating this tribute to the animation artist who directed 65 of the X-MEN:TAS episodes and has art credits on 79 animated series! After the panel Larry will be signing autographs at the Featured Guest area for an hour. Then from 1:15 to 2:45 Thursday Julia and I will join him at his table (HH16) where we will have personally-signed books (PREVIOUSLY ON X-MEN), script pages, and Larry’s X-MEN model sheets. Then on Sunday, at 3:00pm in room 7AB, we three will share the stage with writer LEN UHLEY in X-MEN:TAS CELEBRATES 25 YEARS. After the panel we will join Larry at his table for an hour (4:00 – 5:00 at HH16) and, if there are any left, have books, script pages, and model sheets for signing. Finally, please join us to celebrate the life of X-MEN legend and friend Len Wein, Thursday evening at 8:30 at room 4. We’re back! It’s been a while. We’ve been getting the word out about the book. WonderCon in Anaheim was nice enough to ask Julia and me to set up an X-MEN:TAS panel this past weekend. They didn’t happen to mention that the hall would seat 1700 people! Well, we found out that there is great love for the show: our panel was standing-room-only. Producer-Director LARRY HOUSTON and writers LEN UHLEY and BOB SKIR joined us. Afterward, there was three straight hours of book-signing at our table. We’re not sure what other cons we can manage to attend (a load of 100 books weighs 210 lbs, so flying places may be tough). But we’ll try. We’re set at MomoCon in Atlanta in late May. Writing can be solitary work, so meeting people who appreciate your efforts can be gratifying. Left to right: niece Rev Wiederspahn, Julia, X-MEN:TAS writer Len Uhley, and me. Wednesday night, at the New Moon restaurant in Montrose, California, twenty of the people who worked on X-Men:TAS came together to celebrate the publication of “Previously on X-Men” 25 years after the series premiered. Great fun was had by all. Below are 15 of us. Back Row, left-to-right: Bob Skir (writer), Scott Thomas (producer), Julia Lewald (writer), Stephanie Graziano (Graz Entertainment), Dave McDermott (writer), Margaret Loesch (Fox Children’s Network), Larry Houston (Producer/Director), Me, Marty Isenberg (writer), Jim Graziano (Graz Entertainment). Front row: Len Uhley (writer), Dean Stefan (writer), Avery Cobern (Fox Children’s Network), Steve Melching (writer), Brooks Wachtel (writer). All are interviewed in the book. In the nearly 15 months since we started this site, there has not been a sadder day. Our dear friend Len Wein has died. In the 55-year history of the X-Men, there is no more important name than Len Wein. Without Len, there might not have been an X-MEN:TAS. In 1975, he was entrusted with re-inventing a long-dormant, unsuccessful book. Thinking ahead, he created a Canadian mutant named Wolverine for a Hulk comic on the hunch that Logan might fit in the new X-Men book. Pretty good hunch. He created an African mistress of the elements. He created a haunted blue demon with an angel’s faith. Len was a comics world superstar. When I screwed up the courage to give him notes on his X-MEN:TAS scripts, set within a world he help build, he was always as gracious (and inventive) as he was professional. In our weird business, Len was among the nicest people I ever met. His long, thoughtful interview in our upcoming book was an amazing gift. Julia and I will miss Len terribly. Our hearts go out to his wife Christine. We were pleased to be two of the guests on a panel this year at WonderCon titled: “The Psychology of Animated Series.” The hosts of the long-running “Arkham Sessions” podcast, Dr. Andrea Letamendi and Brian Ward (pictured left), hosted. We and two other, uh, veteran writers (Henry Gilroy and David Wise) were asked to discuss the psychology of some of the characters for whom we had written. Our hosts specialize in the original Batman:TAS, for which Henry and David have both written. Henry has many credits within the Star Wars animated universe, and David was the heart and soul behind the original Mutant Ninja Turtles. Since the four of us together must have a thousand produced TV credits, there was lots of superhero psychology to discuss. One simple distinction that came up was that writers for Batman:TAS tended to focus on the inner workings of the guest villains (the famous “Rogues’ Gallery”), where on X-MEN:TAS we focused on the psyches of the team members. It makes sense: there only a single Batman to figure out; we had nine X-Men, complete with extended families, old friends, and spurned lovers. Some episodes we had enough going on with our core cast that there wasn’t a villain at all. It is always gratifying to meet fans and answer questions about what went into the making of X-MEN:TAS. Now back to the book…. This past Friday, February 17th, marked the 25th anniversary of the green-lighting of X-MEN:TAS, which officially premiered 11 months later. The wonderful folks at San Diego Comic Fest (including Comic Con co-founder Mike Towry) asked Julia and me and four other members of the X-MEN:TAS creative team to hold four panels. Seated with us in the first picture below is producer-director Larry Houston. Also featured were writers Len Uhley, Dave McDermott, and Steve Melching. (Steve and Dave Join us in the panel shown below.). As a nice complement to our presentations, the fest theme this year was a celebration of the 100th birthday of Jack Kirby, co-creator of the X-MEN comic and so very much more. The audiences were friendly and, as is often the case, many among them knew our series better than we did. We watched old episodes and discussed how they and the rest of the series managed to get made. It was great fun for us and was a reminder of why we are writing the “Making of” book, now scheduled for publication this summer. Once the book is ready, we hope to visit Cons around the country, perhaps one a month. We hope to see you at yours.